Patio Space Heaters Whether it's a light outdoor lunch, snack or a more formal dinner, our matching Lancaster Dining Sets make for the finest of outdoor entertaining. This rich Bronze finished cast aluminum is easy to care for and with its classic cross-weave styling, has the look of antique wrought iron. Dining chairs include outdoor seat pads in your choice of indoor/ outdoor fabrics. Sunbrella fabrics available at an additional cost. Light assembly. Entertain your guests outdoors year-round with our patio space heaters. Using a 20 lb. Propane tank (not included), these heaters produce plenty of heat to keep your guests comfortable during the chilliest weather. 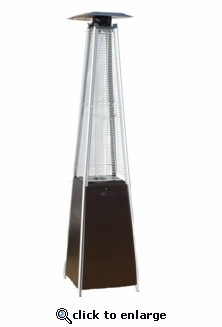 Styles include either a woven resin body or a quartz glass column pyramid with a rich Bronze finish and feature wheels to easily move them around. Aluminum frame. Assembly may be required.